Released at Comic Con, by Warner Bros. Animation, holy moley does this cartoon look sweet. Featuring the behind the scenes teases of the upcoming animated series, Young Justice, this clip shows shows off Robin, Superboy, Kid Flash, Miss Martian, Artemis and Aqualad - plus cameos of a Justice League "16 members strong" including Captain's Atom and Marvel. 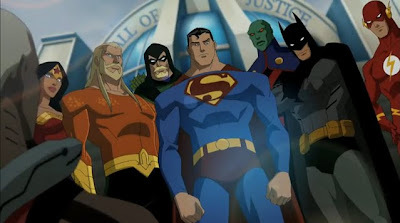 Can we get a shot of that Justice League again? Yip "Wow" just doesn't describe it. I hope Aquaman is attacked by some pair of sentient scissors in the first episode. Ha! True - he does look a bit like Thor in Aquaman's clothes. I was on the fence about this shwo before. 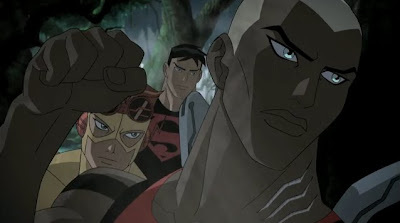 None of this generation of Titan/YJ really move me, but the still of Reddy and Batman talking ot these kids is too cool to ignore. The video itself sold me from there. I'm glad to see DC really upping the ante. The quality on this show appears to be equivalent with their Direct-to-DVD releases. Nice stuff says I. As for Aquaman, yeah, he could use a trim. Just me or did Mattel miss a really big boat with this hitting in November and no tie-in toy line being announced for it so very close to the holiday season? Yeah I'm surprised the toys aren't been touted as must haves for the Christmas list yet. But if the line takes off like that clip suggests, no doubt the crew will be on everything from schoolbooks to shoelaces before long! I haven't really watched more then a couple of episodes of any 'toon since Fox's X-Men, but this definitely has caught my interest.